When you are in Rome do as the Romans do. Different places have different customs. The Almighty is a great designer and has created a great number of different things. Therefore, the world won’t be too monotonous. Knowing other cultures can add more colors to a person’s life. One of the famous tourist attractions which is well known for its uniqueness is Trunyan village. In this oldest village, the way villagers take care of the corpses of their family members is so weird. 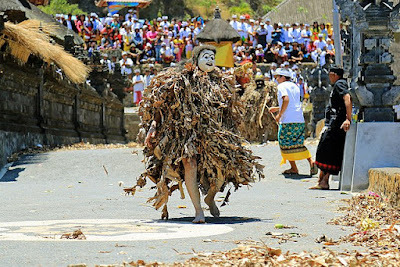 The Balinese have the tradition to cremate human remains, so that the souls will be able to obtain a better life and live in heaven. However, Trunyan village has its own way to handle the dead. In Trunyan village, the deceased are laid in a special location called seme wayah (old cemetery). Though all the corpses are left in the open air, none of them gives off putrid smell. It’s unbelievable that no chemical substances were applied beforehand. You may go to that traditional cemetery by land, but it is too risky as the isolated place is shielded by steep and jungled slopes. If you set your starting point at Kedistan harbor and go by boat through the lake, you need 45 minutes to arrive at the destination. It will be helpful to hire a tour guide to go with you and he will explain everything in more detail. You’ll feel that everything is so spiritual after you set foot on that location. There, you are welcome by the ancient temple. While you go in, you’ll see human skulls in rows and boxes for tourists to contribute some money to charity. There is a very old tree called Taru Menyan. Taru means tree and Menyan means fragrance. This tree is able to neutralize bad smell of the corpses. According to the information, the ancient tree has lived for thousands of years and it is the only one in Trunyan cemetery. A lot of skeletons can be seen while you’re walking around. If you’re lucky, you’ll see a new corpse which hasn’t decomposed yet. New corpses are placed in bamboo cages which suit their sizes. Wild animals won’t have the chance to pick the flesh off the bones. Not all the dead bodies can be rested in this cemetery, only those who died of natural causes are allowed. Children who passed away after their milk teeth had been replaced by permanent teeth are also permitted to rest in peace under Taru Menyan tree. Only eleven corpses can be placed under that ancient tree. If a new corpse arrives, the old one will be removed to make room for the new inhabitant. That’s why you don’t need to be too surprised if you step on some human bones while you are walking. A person who died in an accident can’t be treated in the same way and should be buried as soon as possible. A man’s dead body is difficult to decompose in the cemetery if that man had committed a lot of sins during his lifetime. It is said that the villagers in Trunyan village are the indigenous Balinese. They’re the descendants of Mojopahit Empire. They will be very pleased to tell you everything about their religion and culture. The people are very friendly and glad to welcome visitors from all over the world. If you go to Bali on vacation, don’t forget to have a tour to Trunyan village. I’m sure you’ll be very happy and enjoy spending your precious time at the ancient village. If you trample on a skull, just say sorry because you don’t do it on purpose. To forgive is divine, so it’ll surely forgive you.